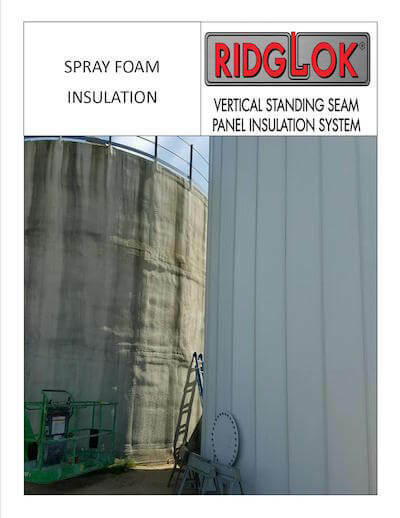 This RIDGLOK® Vertical Standing Seam Panel Insulation System was manufactured at our facility in Reed, KY for installation on a storage tank constructed for fire protection at an aviation facility. The tank measured 20.8’ in diameter and stood 23.59’ high. The tank was positioned in close proximity to another tank that had existing spray foam insulation. Spray foam insulation on tanks will maintain a fair R Value, however, the consistent maintenance with re applying the top coat of UV inhibiting paint is crucial for the spray foam to last. As you can see the appearance of spray foam is less desirable compared with the RIDGLOK® Vertical Standing Seam Panel Insulation System. Upon completion of the project the General Contractor stated that the work was completed satisfactorily and that he would recommend the RIDGLOK® Panel System to others. MC&I is the proud manufacturer of the RIDGLOK® Vertical Standing Seam Panel Insulation System for ground storage tanks. RIDGLOK® insulation systems are engineered to be energy efficient, durable, and cost effective. RIDGLOK® can be used for both heated and cold storage applications without the need for taking tank out of service. This tank insulation system can be applied to all types of tanks, including flat bolted, chimed bolted, glass lined, fiberglass, welded, stainless steel, and concrete. ADVANTAGES The RIDGLOK® vertical standing seam panel insulation system is a smart and efficient thermal barrier, helping save money on utility costs of heating and cooling the tank. Insulate your tank with RIDGLOK®! The RIDGLOK® Vertical Standing Seam Panel Insulation system is used for freeze protection in fire protection tanks. 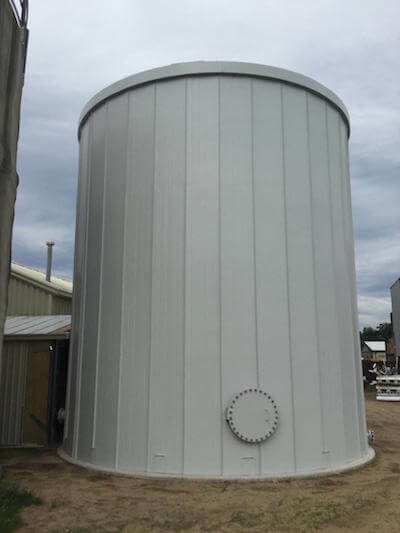 The panels can be applied to all types of tanks, including flat bolted, chimed bolted, glass lined, fiberglass, welded, stainless steel and concrete. The tank does not need to be taken out of service to install the system. 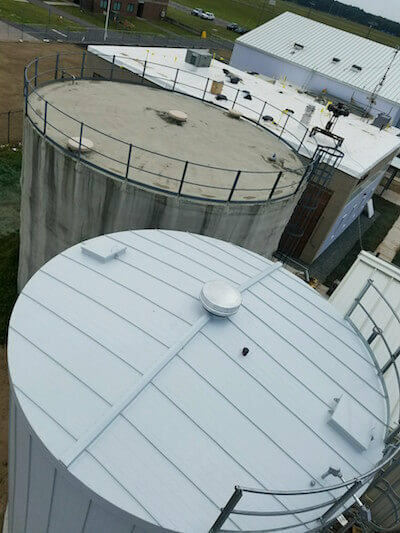 Insulating fire protection tanks with RIDGLOK® Vertical Standing Seam Insulation provides energy savings by reducing the amount of electricity needed to heat the tank. RIDGLOK® Insulation Systems are utilized for freeze protection on fire water supply for wet sprinkler systems. Fire protection water storage tanks that are in colder regions are required to have tank heaters and permitted to be insulated to CONSERVE energy per NFPA 22 codes section 16.1-16.5.